Swimming, food and other stuff! We need to fuel our kids with the right food for several different reasons, please read on to find out why. 3) When you swim the water ‘buffets’ your body, which further breaks down your bodies GLYCOGEN. You need to replenish this as quickly as you can. If you do this, your body will recover quickly, you won’t feel tired & as a result training will be easier the next time and you won’t fall asleep at school! 4) Drink water or watery juice when training, please don’t use sports drinks. Sports drinks are expensive and are best used on competition day and only in small quantities. 6) Carbohydrate Sugars, when buying biscuits or flapjacks look out for this information: Carbohydrate 90gms of which is SUGARS 30gms this is a 3:1 Ratio & GREAT! If the sugar had been 45gms then that’s a 2:1 Ratio and not good! Competition days can be very long. Plenty of water or watery juice is essential along with food from the above list. Food should be eaten little and often. 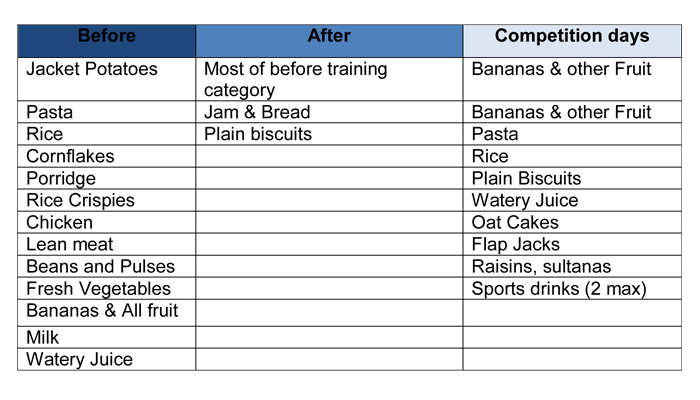 I’ve seen so many swimmers perform badly as the day wears on only to find out that they’ve consumed little food or the wrong food and several bottles of sports drinks!